Sports Day this year was held on 23rd July, long after the scheduled April. Besides the must-have sport events, I personally love the tradition of having march past for each and every class under the roof. The lower six this year was lucky to have participated as I don't have the chance last year since sports day was over when I enrolled into lower six. Hopes were high for my class as we are aiming to be the best marching class in the form. Challenges such as to complete the march past within 2 minutes and the lack of time to practice during school hours definitely make us headache. Nevertheless, we practiced with our own initiatives for 2 days after school and we managed to synchronize the timing which turn out to be the best in the form. 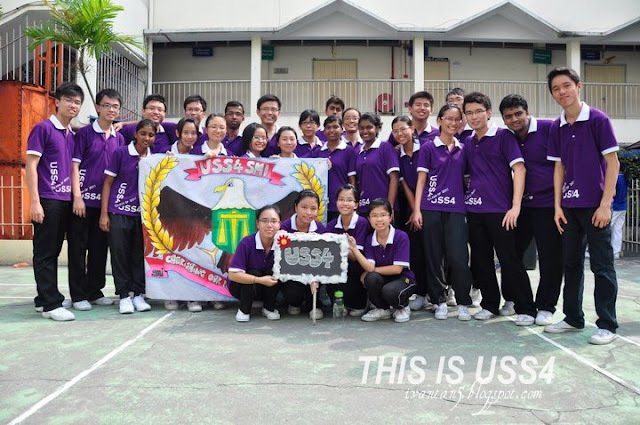 Credits to Geston and Chau Yeong for designing and making the class tee for us. Special thanks also to my class one and only commander, Kar Heng and the formation planner, Zi Xuan. 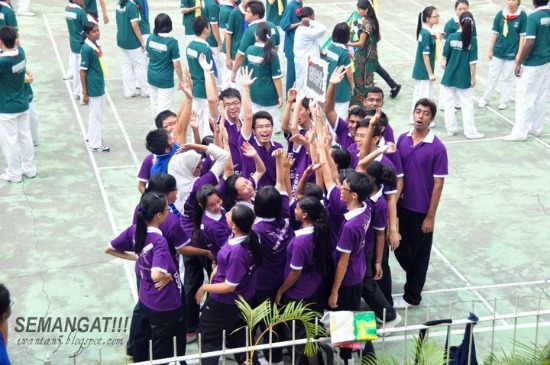 The atmosphere during sports day is filled with energy every year. Cheers and yells could be heard from any part in the school. We were practicing for more than 5 times on that day I suppose. Before the real march past, we even went to the food court to quench our thirst. As form 6 are the ones who will be marching lastly. We waited for quite a long time and just few classes before us, it started drizzling. It keeps getting heavier and for a short period of time, it stopped but not completely, so we went on with our marching. Thank god when we are doing our formation, the rain was not heavy and we managed to complete our formation successfully. I always considered myself as one lucky guy on earth. Surrounded with friends wherever I go and back to the warmth of my home everyday, I have no regrets in life. 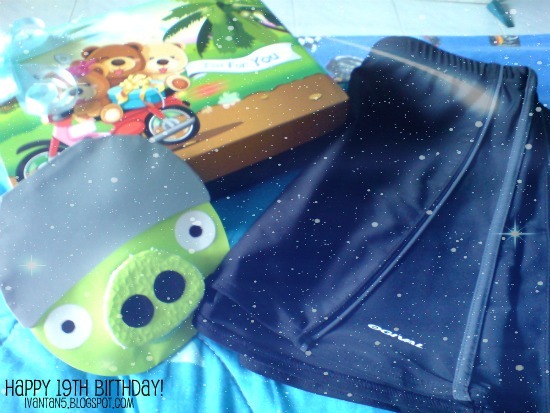 When i woke up early in the morning, I saw a figure walking towards me and dropped something which appeared to be a present on my bed. The figure was none other than my elder sister. My phone beside me flashed with 7 messages. I read all the 7 and of course the first was from my dearest. While I was bathing, it's so random that I suddenly thought of Donivald. I remembered he was the first to call and wish me on phone right at 12 midnight few years back. I was rather disappointed to know that none of the 7 messages is him. However, when I checked my Maxis phone, the one and only message was him. 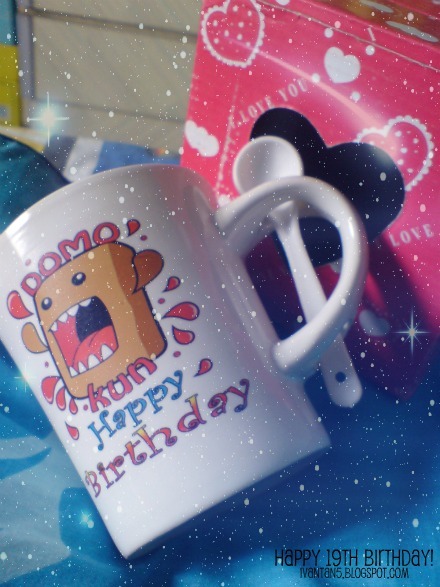 Just before school ends, my awesome classmates gave me a birthday card with a domo face as the cover. It's a tradition that the birthday boy will receive a card from the class. Birthday song was sung once again. 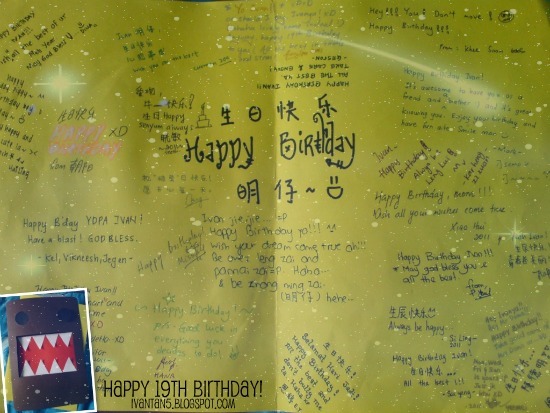 To be frank I really appreciate all the wishes which my classmates wrote for me and I can't seem to find a suitable word to express my gratitude. Not long after that, my fellow friends from other classes joined too. They bought me a cake and the song was sung for the 4th time. It was really a moment that is impossible for me to forget. 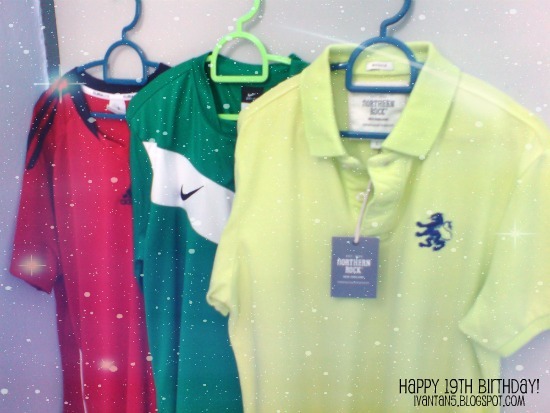 The red adidas shirt was from my elder sister, green nike from my parents whereas the lime northern rock was from my 5 close friends - Yee Lim, Bear, Chris Chow, Vincent and Haw Tung. Went to parade to meet up with my younger sister and she gave me a mug. Thank you to the 247 friends who wished me on facebook. I replied to each and every post without the 'copy and paste' function. Thanks Xin Yan for being an awesome friend of mine since form 1.